Q. Illustrate Simple ALU Organisation? An ALU comprises circuits which perform data processing micro-operations. Though how are these ALU circuits used in conjunction of other registers and CU? The simplest organisation in this respect for fixed point ALU was proposed by John von Neumann in his IAS computer design. In this ALU organisation division and multiplication were implemented employing shift-add/subtract operations. 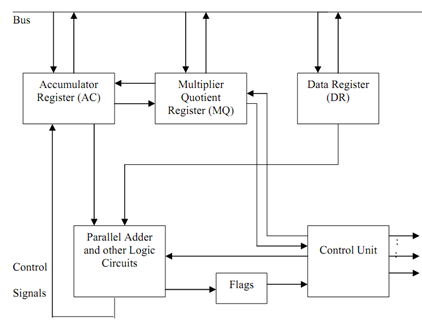 MQ (Multiplier-Quotient register) is a special register used for implementation of division andmultiplication. We aren't providing details of how this register can be used for implementing division and multiplication algorithms. For more details on these algorithms please refer to further readings. An example of this type of algorithm is Booth's algorithm and you should refer to it in further readings. DR is another significant register which is used for storing second operand. Actually it acts as a buffer register that stores the data brought from memory for an instruction. In machines where we have general purpose registers any of the registers can be utilized like AC, MQ and DR.